Taking a break to do fun stuff. This dress was bossa nova’s group freebie with her latest release. And of course I had to show off Starley’s new Fall skins (which may be my favorite makeups of the Vogue line so far). You can barely see it but the necklace from Sub Rosa called Sweet Delight looks like something I own in real life. The hair is cotton candy by Sugar Cube. I’m not wild about lots of use of 2D prims to make hair. Strands usually end up sticking weirdly out of my chin for some reason. Tesla dropped these shoes on me, now I have never gotten into the pointy toed shoe fad (I know, shock), but these are pointed without looking like trying to go to needle points. They are supposed to be leather textures, but to be honest it didn’t look like leather texture to me (maybe it’s just this crazy computer I’m using). Despite that I really love the look of these shoes. I feel I need a public explanation for this. If I contacted you about voting in the Blogger’s Choice Awards and you go to the URL now you’ll find a note and no way to vote currently. The URL for voting was getting more non-bloggers than bloggers so I made the decision to shut it down for now. I have no ideal how so many nonbloggers got the URL, but it happened. I was up until 4 am this morning. So I’m going to take a few days break before trying to get it set up again. The Nominations for the Blogger’s Choice Awards are now closed. Voting will reopen once I get the poll coded and formated and run until Nov 15. In the mean time, everyone’s invited to participate in the People’s Choice Award. I’ve used all the nominations for various categories. 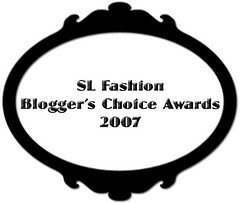 There are a few well loved SL fashion artistes who requested to be removed from the list. Remember that voting more than once per IP address will only count 1 of the votes. These are just a few of the items you will see at the New Shoots show tonight presented by Metro Models. First off is the raffle prize I won. Next is a review copies from AnnaH. This one is probably my favorite. A sneak preview of the stuff I’ll be strutting. I was browsing Nyte n Day and found the Mortise sweater. There’s a prim turtleneck that doesn’t replace necklaces. The deep colors are very fall and can be brightened with contrasting accessories. Last night I went to 2 fashion shows. I have some photos. First up is the MODA September showcase that I arrived late to. Flickr photo stream. Second I went to the press showing of New Shoots. The public shows will be Friday & Saturday (check the calendar for more details). I will be modeling in the Friday evening show. There are freebies being given out as well as a catalogue of items being show & a raffle prize. Flickr photo stream. As always if you read from Fashion Planet please visit the blog to see these slideshows. More later when my ISP decides to work. You are currently viewing the archives for September, 2007 at SL Fashion Notes.